I developed this little text manipulation utility/editor to explore ways of extracting key words from large amounts of text. You may find it useful for that or some other purpose. Remove special characters e.g. punctuation etc. To get started paste some text or drop a file into the top text box, select some options from the aptly named ‘Options’ tab, return to the tab above and hit ‘Go!’. Your results will appear in the bottom text box. You can change your options and hit ‘Go!’ again to see different results. When you close SWEAT down it remembers all of your settings including the exclusion list. The options shown above are executed in the order shown on the form which may explain why you get results you were not anticipating. They are fairly self-explanatory but if you are not sure, don’t worry, you can do no harm, experiment. The exclusion list (Remove words listed below tick box) can, in my experience, get pretty big when working on large bodies of text. These words are saved, capitalised and alphabetically ordered when you close the program for easy reference the next time you use it. This entry was posted in Freeware, Software, Techno Freak and tagged editor, free, freeware, keywords, manipulation, pc, software, sweat, text, windows by RedEyedMonster. Bookmark the permalink. hello, nice job, swat really rocks! I know it’s a few years after the last release, but curious if there’s a possibility of future updates? I just recently discovered this after months of using three (yes, three!) different websites to split walls of text into alpha sorted unique words. I create DLC for the Fantasy Grounds virtual tabletop and search keywords is an important function of the reference manual feature for users, and SWEAT makes it so easy! The main additional feature I’d like is a setting to strip out all HTML / XML tags (basically anything contained in ). Then perhaps a button to copy the results to the clipboard and another button to clear the window. I CTRL+A but it doesn’t always “take” the first try and it always sets off the Windows “bell” sound every time I’m selecting anything in the window. 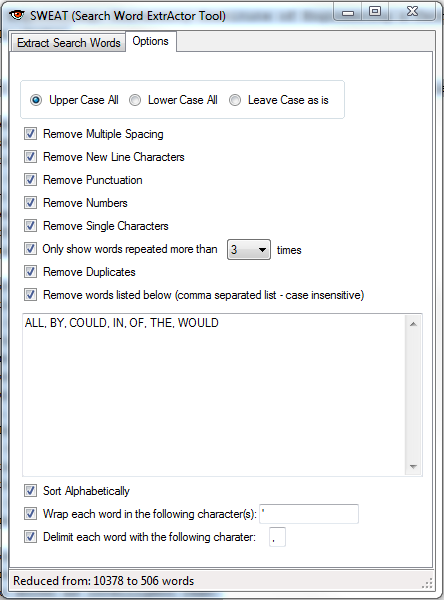 …………..And (if I’m not to greedy) a sort option to sort a list of words by length? Indeed the performance is now greatly improved. Thank you for that. Is it possible to implement a random sort option? Thank you for your Good program. I love it. But I would like to suggest some additional options. Could you consider my suggestions? 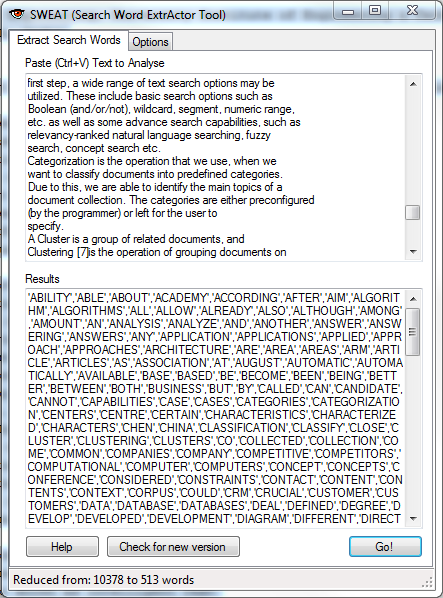 Add a display option for New line of results on the Extract Search Words window. My suggestion is that display the results with new line the each word if select the display option button. I don’t know which is better. Select the display option(new line) before clicking the Go button or after checking the results. Anyway, please consider my suggestions. I always stay at budget hotels near of Jimbaran beach When I visit Bali. Jimbaran beach is one of my favorites place. Add a save function for results. Save as txt or csv. Add a Language option for convenience of non-English speaking people. Download language file or Embed language file into SWEAT. Thanks for you suggestions – look out for the next release! need more space and capacity for the function of remove “Remove words listed below” in order to use as vocabulary pool. sorry, just noticed that it does remove duplicates but not if its a list. Can you explain what you mean by ‘list’ & I’ll take a look. Thanks. it doesn’t delete duplicates if they are like this. If you select ‘Remove New Line Characters’ this will solve your problem. I will try and think of a way to maintain line breaks. I just noticed that the remove duplicate words function is no longer working. I have a list of words, and I check off remove duplicates but it doesn’t work. I remember it worked on the previous version. I’ve been trying to remove words that exist in text A from text B, but I could not figure out how to do that until I stumbled across this very useful program. It works perfectly for that! You’ve saved me countless hours of drudgery. Thank you so much! Thanks for downloading, happy to help. Thanks for your program but way to slow. To strip 1248 lines of a word list containing numbers it took the software a couple of minutes. Ctr + A wasn’t working in the input fields so removing of the data was a painstaking process. Program need some improvements in my opinion. Thanks for your feedback, I have looked into the Ctrl+A issue and it seems to be working fine. Does anyone else have a problem with this? Regarding the speed issue, this is just a little utility I knocked up for experimentation, thought it might be useful to others and thus offered it free. I appreciate having to wait a few minutes can be frustrating but perhaps the time can be used to reflect, chill or maybe boil an egg. Enjoy those moments 🙂 However in the next release there will be a great improvement on performance, so make the most of that free time! Anyway, a useful and promising app. Great, thanks for your suggestions. Drag and drop has now been added. – SWEAT remembers its position on desktop after re-start. – ‘Keep on Top’ – perhaps via a button. – an addition to ‘Keep on Top’ – ‘Drag&Drop’ not only files but strings of text from documents, browsers, etc. By the way, ‘CTRL+A’ works fine for me.